If you like Mickey Mouse, this man deserves your appreciation. We’re back from a two-week hiatus! 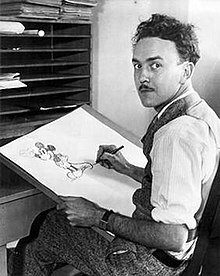 This week, the Watchamacallit joins us for a discussion of Ub Iwerks, as a follow-on to his presentation on classic Disney animation at ConnectiCon 2011. This entry was posted in Animation, Mickey Mouse, Ub Iwerks, vintage cartoons, Walt Disney by Jennifer. Bookmark the permalink. Obviously, the Whatchamacallit has a good grasp of the early animation. Heading over to the Internet Movie Archive to find some of these Cartoons that Time forgot!